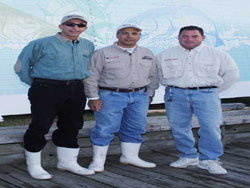 Andy and Kyle Ondrey round up their A+ team consisting of Eileen Miller, Mitch Wergiles, and Steve Palmo for the 2010 Manhattan Cup sponsored by the Fishermen’s Conservation Association. They start their morning jigging and plugging bass off the beaches and later tough it out through a grueling chunk bite in Raritan Bay working through bluefish after bluefish and having a good striper to end the day, but it just didn’t have the size to put in the striper tube for the weigh-in. 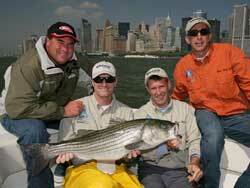 This past year the Manhattan Cup teamed up with the Wounded Warriors Project. 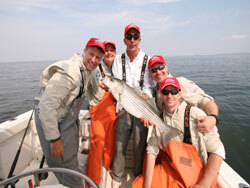 Quite a few boats in the fleet had the honor of having retired military officers to fish with them. They all had a great time and were amazing people to meet. The FCA Manhattan Cup has become the premier inshore fishing tournament in the Northeast and the largest catch-and-release tournament in the tri-state area. Angler’s fish for the largest striped bass, bluefish and weakfish among three categories (fly, artificial and bait). There is a LIVE RELEASE Division, where anglers return with a striped bass in a special device to be weighed in and released alive at the dock.